I do believe this is our second to last bathroom to design in this house (stay tuned for the upstairs guest bath still to come). 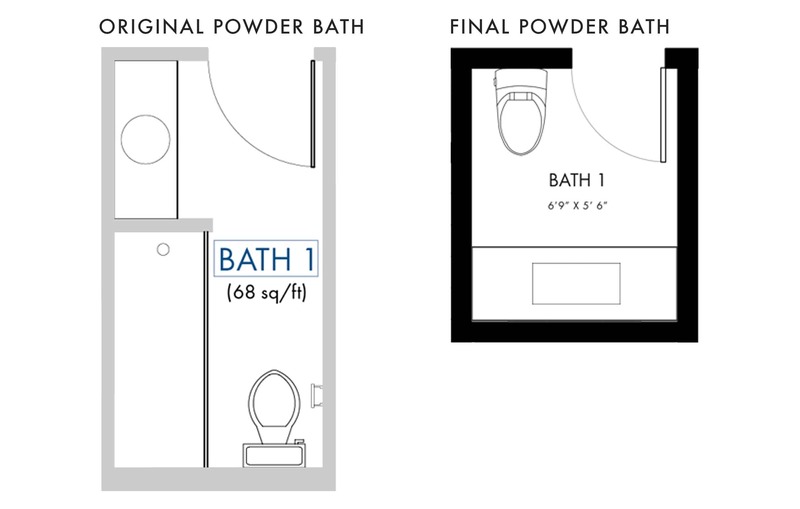 Remember when I was designing nine bathrooms at the same time? Talk about an education in bathroom design, crash course edition. It feels like I had to write a well-informed senior thesis, but I missed all the lectures during the semester and had to figure it out all on my own. All of which I can’t wait to tell you about (and yes, book #2 is happening, folks and it’s not just about bathrooms). But since another full bath is right behind it, we decided to make it smaller and make that bathroom bigger. Here you can see what we thought we were going to do with the powder bath (i.e. it would be a traditional guest bath) next to where we landed, which is much more compact but perfect for guests to pop in and out of. For the fixtures, faucets and accessories of this bathroom, we partnered with Kohler again. The exciting part about this specific product was we got to pull from their new Components line which is pretty darn beautiful (and super customizable so you can get EXACTLY what you want). Here’s how this line works: First, you pick your spout from three different profiles (we went with the Tube, but there’s also a “Ribbon” and “Row”…all of which are really stunning, simple and modern), then you pair it with either a rocker handle or the more industrial round handle trim we opted for. It currently comes in two finishes (polished chrome and matte black), but they’re releasing titanium and brushed nickel next year. The matte black is the perfect finish and man, the shape is so beautiful and clean. 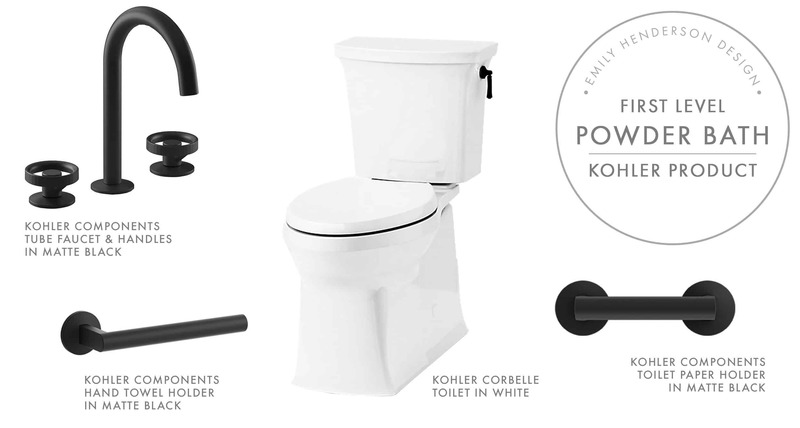 We used the same toilet here (Corbelle) that we did in the kids’ bathroom but paired it with a matte black handle to tie in with the Components faucet and accessories. A few highlights about this toilet that are pretty darn cool (or at least, make my life a little easier): Kohler offers its ContinuousClean feature, which together with their CleanCoat technology and Revolution360 swirl flush, fights germs and features their “cleanest flush yet.” I broke down more info on this technology in the kids’ bath post (see that here), but as a refresher, it keeps things clean by dispensing a constant dosage of a cleaning tablet, which means less scrubbing on your own. 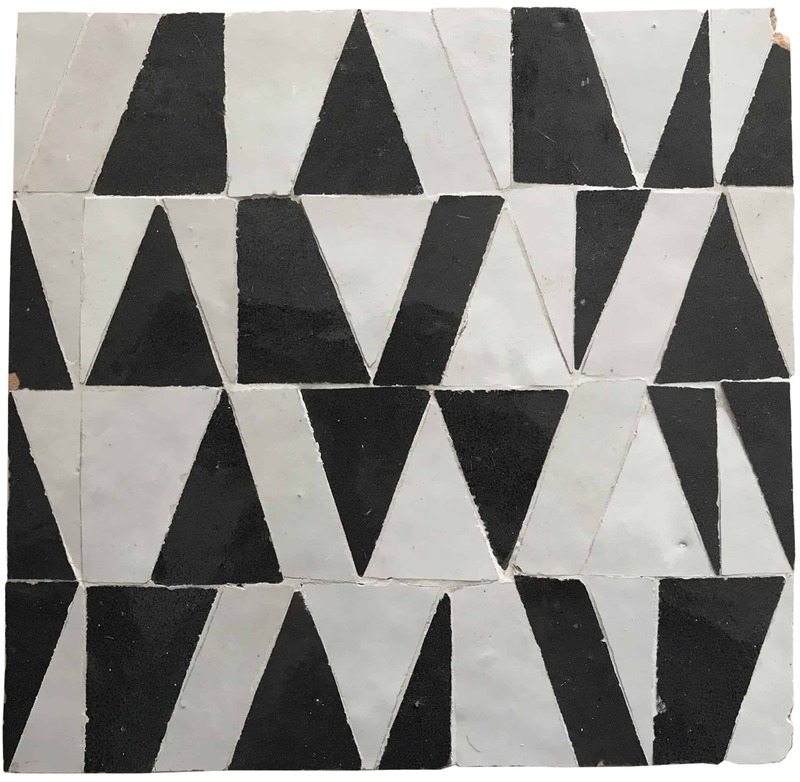 After the faucet and accessories line was chosen, I fell right in love with this mosaic tile from Clé (it’s not available just yet, but it’s coming soon). We started creating the mood board and threw all the products together and it’s looking pretty fun, but certainly a little busier than the rest of the house is coming along. At first, we had a 36-inch vanity (Tresham, from Kohler) on that wall but once we finalized the floor plan of the house, we realized it could (and should be) much bigger and while we could have ordered a 60-inch vanity, a custom built-in wall-to-wall vanity got us super excited. It will be custom made from Bedrosians stone. We loved the idea of floating it, but wanted to add some storage or at least somewhere to put toilet paper in a cute wood basket. The Allied Maker pendants are pretty amazing as the light shines down into the glass that hangs from a leather strap. The flooring will be the same wood as the living room which is still TBD, but we wanted to put in something to reference the warmth they will bring to the space in the rendering (otherwise everything might feel too cold without it). But then I fell in love with this tile, also from Clé. It’s a terra-cotta tile with the most BEAUTIFUL hand-glazed blue finish. It is matte, but has a lot of movement and that color is my color. This board came together rather quickly which is always a good sign. I love how the Components line pops off the tile more since it’s solid on solid. I’m really into how this room is simpler, more understated and works with the rest of the house so well. But a true I Design, You Decide couldn’t be just a switch of a tile, so we tweaked the vanity (not having it go to the floor) which the design team prefers, while I’m on the fence. I like both, honestly, but I do like that this one feels less heavy (against a darker backdrop of that tile, it’s nice to have an airiness). 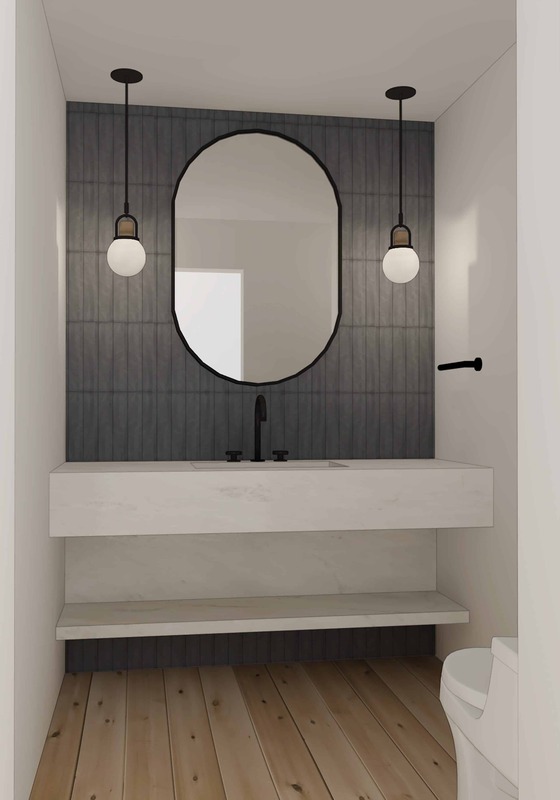 I think I might prefer the smaller scale of the pendants here, and the wood certainly adds some warmth, plus the scale and shape of the pill-shaped mirror (which would have to be custom made) just works so well in here to soften the harder marble lines. I’m a massive fan of mixing round with square and have in every room. For instance, a square pendant with a rectangle mirror would just feel too harsh and modern with the rectangle brick and the vanity. It’s important to find a balance in shapes so nothing is too angular (or too flowy if, say, everything had a round profile). Thank you for doing your daily design duty. A five-night stay at the cabin in 2019 (with some blackout dates, of course, because our family uses it) with $1,000 towards travel expenses (if you live driving distance then it’s just fun money, or if you live internationally then we will cover up to $1,000 of your expenses. So, all the international readers please feel free to participate and enter as well). We’ll make it a dream trip! Including cocktails out on the lake with me. You will get one entry into the vacay giveaway. Please enter your contact info so we can get ahold of you if you win. Thank You. You are wonderful. Please enter your contact info so we can tell you if you've won. Every time you share you get an extra entry into the vacay giveway. Why don't you share it? I love the blue tile and marble vanity but not the pendants so much. I like the pendants with the black and white tile better but still love wall mounted sconces the best. that’s exactly what I scrolled down here to post! another vote for blue tile w/ option 1 pendants! Same here! Pendants from 1 with blue tile from 2! Ditto!!! Was coming to post the same! yep, blue tile but pendants are either wrong shape or too small. I voted blue tile and also prefer the longer pendants and the vanity to the floor in option 1. Agreed!! Pendants from number 1 PLEASE! Love the blue tile. The handmaid texture is really going to stand out with it’s simple color choice. I too love the pendants and mirror from option one. The leather is soo good. Me too! Pendants from #1 are great. Totally agree! Tile from #2 but mirror and lights from #1! Completely agree!!!! Love the option 1 pendants! Completely agree! 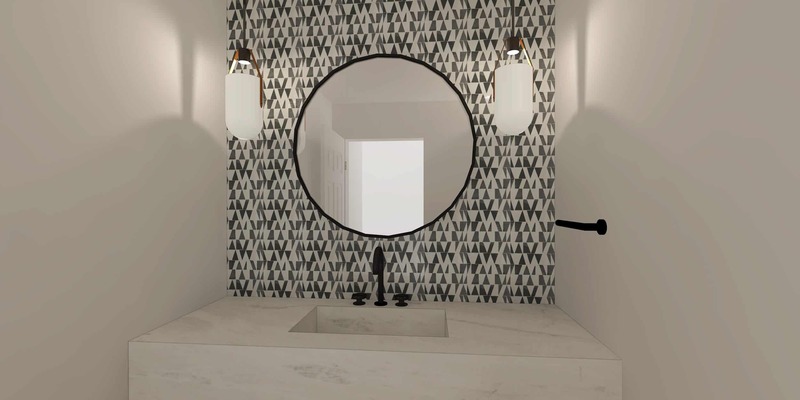 Love the tile in #2, the rounded mirror, and the floating marble, but DEFINITELY the pendants from #1. The tile from #1 is awesome and I hope you use it somewhere, but not in the mountain house. Oh and one more thing… I really like the marble going down to the floor which seems cozier- modern but not as cold for some reason. Me too. I voted blue tile but prefer the vanity in the first option. Yes! Essentially everything: sink design, lights, and mirror of option 1, instead with the blue tile. I think I might’ve liked the other tile if the pattern was larger and less busy and looked more like a tonal terrazzo. I only voted for #1 because I preferred the pendants, vanity and mirror more then option two. yes to vanity from option one with tile from option 2! I like the circle mirror and sconces in option 1 but the tile of option 2. Or it might be that the mirror is just too high in option 2…. looks like all kids would never be able to see themselves. Me too! I want the tile from #2 but the mirror and pendants from #1. I really can’t stand the racetrack mirror shape for whatever reason…. ha. we call it ‘pill shaped’ but yah, it is kinda ‘race-track-y’. although I do love it. Agreed. Round mirror with those amazing pendants with the leather and the blue tile. I voted for Option 2, and love a pill-shaped mirror, but oh those pendants from the first option!!! 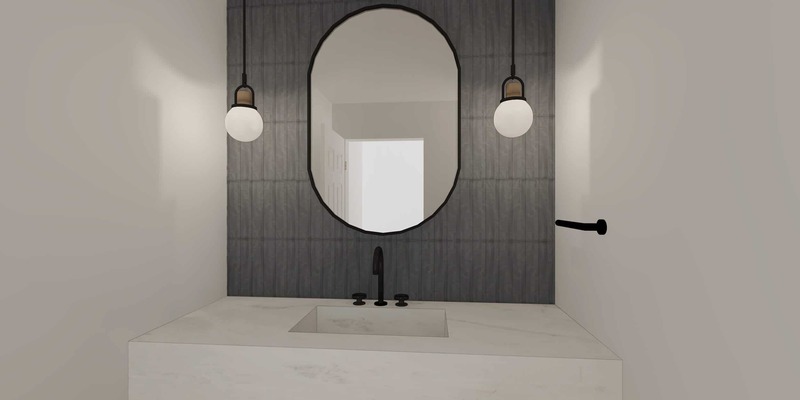 Maybe you should reconsider the round mirror because THOSE PENDANTS… This bathroom is going to be stunning. Yeah much prefer the pendants in the first option! I can’t help it, I LOVE that first tile!! Maybe the rendering of the second tile is just not doing it justice, but after the fun of the first tile, the second just felt “blah” as my 5 year old might put it. That being said, before I got to the second choice, I did question whether it fit w/ the rest of the house’s vibe. But, my (internal) response to that was if Emily saw it could work, that’s good enough for me! I also REALLY love those light fixtures in #1. This is the first time I feel like I’ve gone against the direction you/your team is leaning. But that tile is just so great! I’m with you, Lauren. That tile in option 1 is fantastic. The blue one looks bland in comparison. I totally agree 100%! I’ve followed all of the i design, you decide posts and I’m most passionate about this one. PLEASE go with option 1. The blue tile looks rather boring. I also agree! I love doing something a bit more wild in the powder. Love them both but Voted for #2 – would prefer the vanity going to the floor !!!! Option C please! The second tile, but with the mirror and pendants from the first one. Same! I also like the vanity to the floor. So really, the first bathroom but with blue tile. HA. everyone wants #1 with #2 tile! Oh dear! Add me to that vote! Me too! Though I also like the smaller scale lights with the pill mirror. Option 1 vanity feels more like a piece of furniture- which reads more cozy. Same here – #1 felt lighter and airier to me, while #2 had more of a dark, modern vibe. I voted for the blue, but I REALLY prefer the vanity that goes all the way to the floor. I prefer the second vanity option, so that makes my vote pretty easy! Oh- I love option 1. It’s so playful. The dark blue tile and marble vanity feel very formal and serious to me. Not the relaxing vibe of a mountain retreat. ^^This. The tile in Option One feels like a breath of fresh air to me. 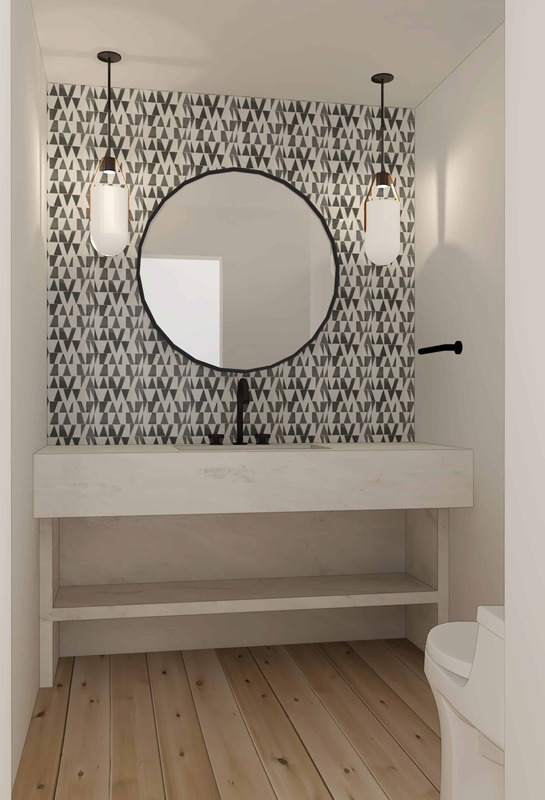 Tile 1 is so much more original and more mountain-housy in my opinion, and the first vanity looks less as if it were in a subway station – much nicer and more homely in my opinion…. its a powder bath so while we definitely thought about the storage options we decided that a pretty shaker basket with toilet paper and a stack of hand towels is probably all we’ll need in there. The laundry room is directly across the hall that will house cleaning supplies. I just don’t think the tile in the first is right. I love to have one really dark, tiled wall. It is still a statement, but subdued and flows better with the whole home. You want guests who are there for a few hours or a day to have a taste of the whole home without needing to wander through it all. The solid dark tile does that. Both options are really striking and the stone vanity is beautiful. I wonder though if this could have been a great place to bring in more wood for Bryan. The same vanity shape in wood. Can I say that I choose option two, but I really wish that the first light had been repeated. I love both options though. 😀 Love this series! Loving option #2, but with the mirror and pendants in option #1. 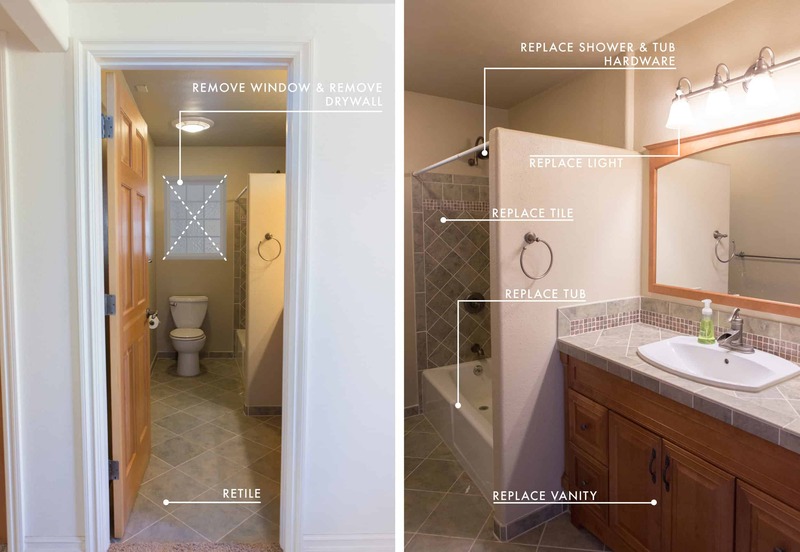 Why not use the mirror and pendants of option #1 with the tiles and vanity of option#2 ? that seems to be the popular vote as of now. eek. Mirror and pendants of option #1 with the tiles and vanity of option #2. Yes. This is my vote as well. I voted for #2, BUT I think #1 could work really well with some more wood elements! I like the blue tile. But I don’t like the sink knobs. Having hand issues, I think the knobs would be difficult to grip and turn. I think the vanity in No 2 would be better if the tile went all the way to the floor, and the bottom shelf was also floated. This would enhance the effect on the top part. As much as I love the first design, the blue tile and floating vanity fits much better with the style of the rest of the house but I like the circular mirror and pendants from the first design. I voted for the blue tile but I really wish you would use the mirror and lighting from option 1. I love the black and white tile in the first option! It’s gorgeous! Option 2 with the pendants and vanity from Option 1. No contest, but I went through the motions of voting to secure its winning status! I truly prefer every style choice on the dark blue tile option. The mirror and light shapes, floating vs floor vanity, and hell yes the tile. The black and white tile is awful to me when it’s covering that much wall, like funhouse with a stabby clown kind of horrifying. And the floor length custom stone vanity feels like stuff I saw while working in a nouveau riche part of town, while making it floating somehow feels more casual-modern and less pretentious. Man, the tile I’m either way on, but the pendants and the legs on the vanity from #1 – all the heart eyes!! (Though I love the pendants from #2 also…). I really, really love the legs on the vanity. How about a mash-up of the two? Replace the black & white tile in Option 1 with the dark tile from Option 2 and call it a day. 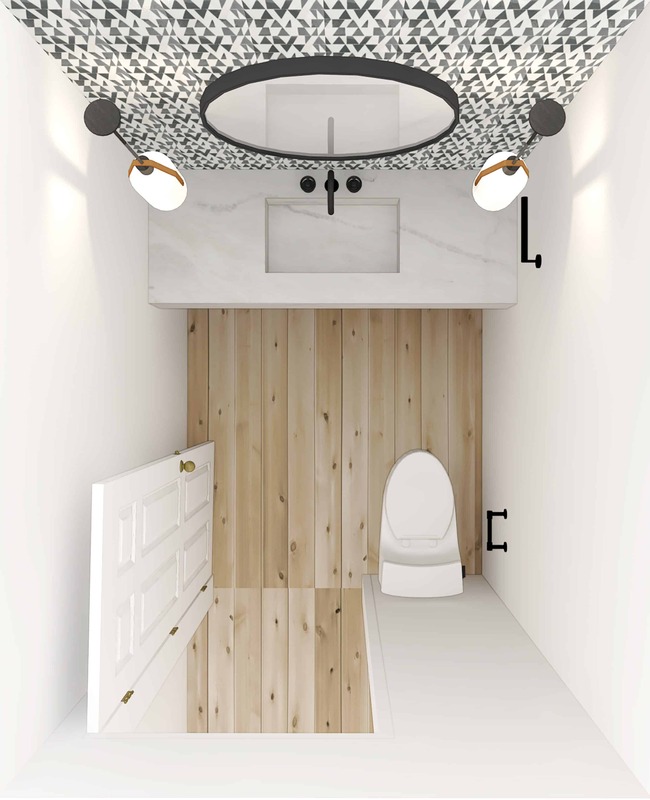 Option 2 is too dark for a windowless powder room and needs the larger pendant lights and the “legs” of the marble vanity. 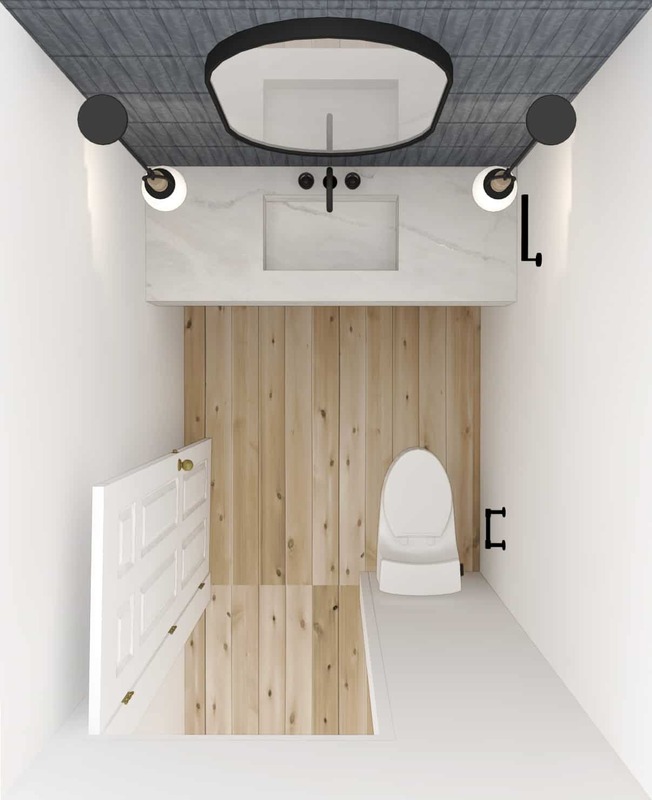 Right now, the dark recess under the floating vanity looks like a place for spiders to lurk — and it’s too much a NYC loft/hotel look, IMO. I prefer Option Two, but as others have noted I want to see the mirror and pendants from Option One in that room. The oval mirror and super round pendants are doing nothing for me, but those longer pendants with the leather strap feel oh-so-right for the mountain house. Agree, pendants are not quite right and I would take vanity to the floor. Love the blue tile. Can we get the blue tile with Option 1’s mirror and sconces? That would be perfection! Tile from 2 but everything else from 1! I think the marble going to the floor instead of the dark tile actually looks lighter. And I love the pendants from 1 but they might be too matchy with the pill shaped mirror. But I trust your judgement and can’t wait to see what you do! Beautiful designs! I love both options, but I don’t have one comment/question. Is this bathroom close to the main living areas? 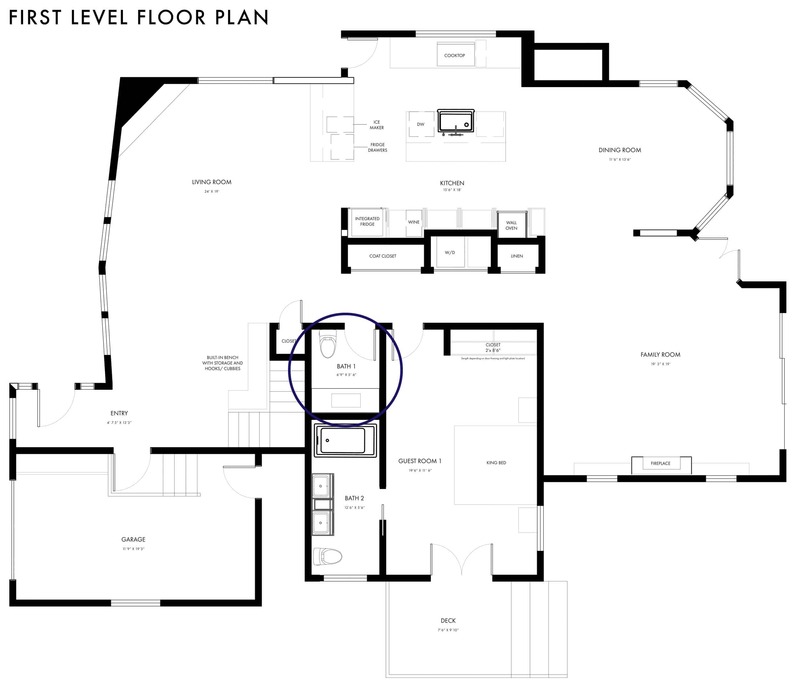 It is kind of hard to tell how close it is to the living room by the floor plan. I ask because the toilet is right on the wall to the outside and really close to the door. Does anyone else feel like that might feel awkward for guests to use? Oh man, option 1 just looks so special/stunning and not just in a “let’s take a risk, y’all” kind of way. Definitely the blue tile. But! Since the tile in the first option is so gorgeous, could you create a post about that tile, some similar/affordable options, and a range of ways to use such a super fun and striking tile? Agree that option 2 fits this house much better and I love the whole look. That said, there’s something about the floating vanity that makes it seem more boutique hotel sleek. The version that goes to the floor has a more artisanal feeling and looks like it was placed in the room, which for some reason to me feels more right than the engineered floating version for this house. Here’s where I wish there were multiple combos. I voted for Option One because I love that tile (and I’m sad it’s trailing in the poll). But, in all honesty, I prefer the vanity in Option Two (yay, Design Team, I agree with you there). Loving the black hardware either way, btw. However with the round mirror not the pill shaped one. The race track shape references the rectangle of the tile to closely and a round mirror would complement it better. I voted for the blue tile because the black and white is just too jarring, but I really love those light fixtures with the leather strap. Can we do a mix and match? The first tile is great, but it really doesn’t feel mountain or like the rest of the house. even with the simpler tile it still doesn’t seem at all rustic to me. Pretty! Just not mountain house-ey. But I’ll reserve judgment till the end! I couldn’t bring myself to vote. I love the blue tile but would prefer the mirror/lighting choice of the first option. I just couldn’t get behind the oblong mirror. ALSO, with the natural cut of the tile (both tiles, but making the case for Option 1) and the natural plank of the flooring, I definitely feel the rustic. The brightness and geometric design of the tile along with the white stone all the way to the floor reads very Scandi to me and also creates a really open feeling to an otherwise small, windowless space. The darkness of the blue tile along with the darkness beneath the vanity feels a bit oppressive in a tiny room without natural light. Okay, second comment from me on this. I’ll get back to my real life now. That black and white tile is everything. I picked #1, but I do prefer the pendants from #2. Gorgeous job, Design Team! thank you for letting me get that off my chest! I enjoy seeing everything you do come together, even when my latent vertical tile issues are triggered. FOR SURE number 2! But have to say I also like the vanity going down to the floor from number 1. Didn’t care for the light fixtures in 1, so glad to see new ones in option 2. I know it’s not the one you’re pulling for, but I LOVE LOVE LOVE option #1! That tile is amazing! I voted for Option One!!! Because…. One of my favorite and likely most impactful design approaches (skills?) I learned from you was to ask “how do I want the room to FEEL?”. While Option Two may be more ‘cohesive’ style-wise, it doesn’t make me ‘feel’ anything. Whereas Option One feels energized and makes me smile (plus, I have a moment of appreciation for your innate quirkiness and am inspired to honor mine). Also, sometimes you need a foil of sorts to make all the other design choices in the Mountain Fixer Upper (that you feel Option Two mirrors/blends with) really shine, right? Option One provides the tension that lets the relative quietness of the rest of the house feel ‘special’ (rather than a sense of ‘sameness’ in/from/with Option Two). While this Cle tile is having a serious ‘moment’ in the design world it is beautiful in an understated way that implies longevity (and the blue is SO You : ). Sooooooooo, if not Option One in it’s original form, then I also vote for Option One BUT with the gorgeous blue tile you love from Option Two. As others have noted, the pendant lights from #1 are mouthwateringly yummy and the stunning vanity with legs lightens the room and just feels gooood (the floating version takes an ‘opportunity’ and turns it into a shadow..?). I like the unapologetic stance of those Kohler fixtures -they are holding their own without overpowering any other element in the room. As always, I am certain the end result will be as beautiful/charming/cohesive/functional/inspiring as-all-get-out! Heh, and I voted option two (after originally leaning toward option one) because of FEELS. It looks like it could fit in a 1920s Bohemian cafe in Vienna! Both of these designs seem to lean way too modern for the mountain house, so I didn’t vote for either one. I love both of these designs. Love the tile in both. I think the to-the-floor vanity in One is more traditional looking; love those lights in One. But they’re both VERY modern without any of the mountain-rustic. At first I really did not like the triangle tile, but then the darker tile makes the bathroom look dark, and I felt it had a feeling of making one to get out of the bathroom sooner whereas the triangle tile seemed to be a bit inviting. I also noticed that in the original tile pattern, it was black and white, and in the one on the wall has tones of gray in it which helped settle down the pattern somewhat. I had the same thoughts as you when reading down the post — that black and white tile doesn’t feel like the rest of the house, it might be too busy, oh that blue tile is beautiful. And then I got to the end, saw the side-by-side and loved everything else about Option 1 better in the end. While these are both stunning, I’m not sure either of feels very mountain-cabin to me, which is likely because of the stone vanity. Did you consider doing a wooden surface? Or even a chest vanity? For me it’s the vanity that looks very cold and modern compared to the rest of the house. Both tiles are gorgeous. For budget reasons, that horrible B word, I don’t think you need to do the pill shaped mirror that is going to cost a fortune. With the round lights I think you can do a rectangle and save the money for elsewhere. We currently have a client doing a similar custom mirror in a satin brass finish and I almost fell off my chair when I got the price, and keep in mind most of our customers are on Palm Beach. I reluctantly voted for 1. I like the sink to the floor but that is about all I like in this design. I thought the mirror could be a chance to warm the room up and add some quirk. Instead it’s blah. I dont like the pendants at all….. I think sconces would be more appropriate. I do LOVE the blue tile!! I definitely agree with a lot of the above comments that say dark blue tile, but with the mirror and lights from option 1. That tile just fits more with the rest of the house. I think the vanity in option 2 is gorgeous, and in my opinion, a better design, and it provides you with the same amount of storage. Also, eliminating the marble from the sides and bottom should save you a little money, which is another positive in the option 2 vanity column. I voted for option 2 because of the tile, but PLEASE use the lights and vanity from option 1! The shape of the lights from option 2 feel commonplace now (I seriously felt like I saw something similar at Lowe’s), and honestly the option 1 lights feel so special and unique. And the legs on the vanity in option 1 seriously made me swoon. Again, if you’re doing something custom I vote for it looking totally custom and unlike something you can buy or see regularly! With all that said, it’s so gorgeous! Can’t wait to the the completed house. I voted Option 1. I like the vanity, mirror and lights better. The tile is also awesome. Whereas, the blue tile is kinda blah. The second option looks like a hotel bath to me. If you don’t use that black and white tile here in the mountain house, you absolutely MUST in another design soon – it is INCREDIBLE! I voted for #1 even though I do understand the tile from #2 fits the space better, but in my opinion everything else about option #1 is better. My vote would be everything from option #1, just with the blue tile. I much prefer the vanity going all the way to the ground and I like those larger pendants better as well. Can there be an Option 3 which is the title of Option 2 with the sink of Option 1? My personal preference is for No. 1 with the vanity of No. 2. I just love the freshness of the tile in 1; 2 feels a bit lack lustre in comparison. BIG sigh. I was tending to option one until I saw them next to each other and reluctantly switched to two. I love the option one tile. It looks like a monochromatic Gee’s Bend quilt. I love the option one sconces, too. That leather strap? Perfect detail. But the overall vibe of option two won me over. It looks like an updated Art Deco design. I like the cleaner look of the option two vanity, as well. Eliminating the side panels was a good idea. Option 3 please! Vanity, mirror and lights from Option 1 and tile from Option 2! I love both options, but for your sake voted for the blue tile. I really love the vanity going down to the floor. It feels way cozier and modern, but not cold. Also I prefer the the pendants from the first option. I hope you can mix it all up! the patterned tile is AHHH-mazing, but the simplicity of the blue tile drew me in, especially for the long term and the mountain vibe you’re going for. I voted for #2 but my actual vote is for all of the design elements of #1 with the tile from #2. I prefer the round mirror, the elongated pendants, and the vanity design from #1 with the tile from #2. I hate to be complicated, but you tend to end up mixing up the designs and integrating elements from both after the vote so I figured I’d put my 2 cents in. Love this series btw. It’s my favourite part of the blog! 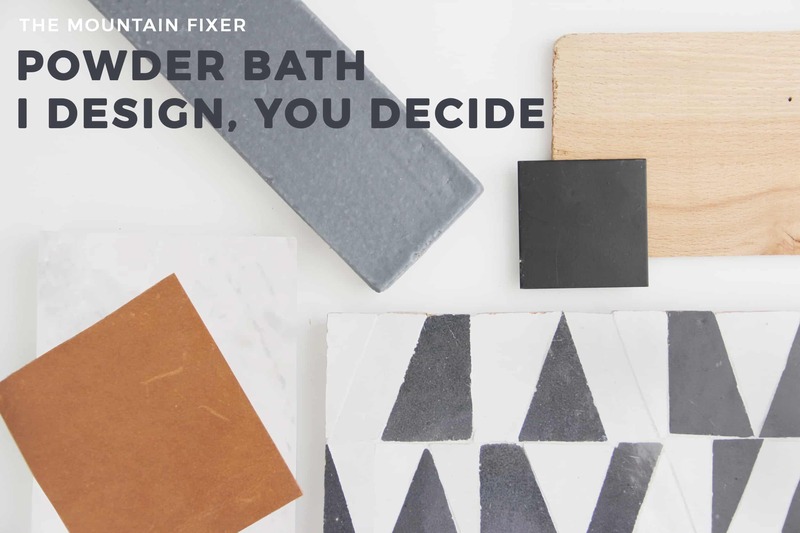 I seem to be an outlier here, but I like the tile from option #1 because it looks like a quilt (cozy and Scandinavian feeling), love the b/w combo with the wood floor (although busy in design, clean and modern in color) and like you said a powder room is a good place to take a risk. Also, I like the pendant light and mirror proportions better. Lights in option #2 seem too small for that mirror and are being swallowed up. Prefer the vanity in option #2. It’s cleaner and the tile at the bottom is a nice touch. Just my two cents. The Option One powder room is smashing. Much more visually interesting than Option Two. 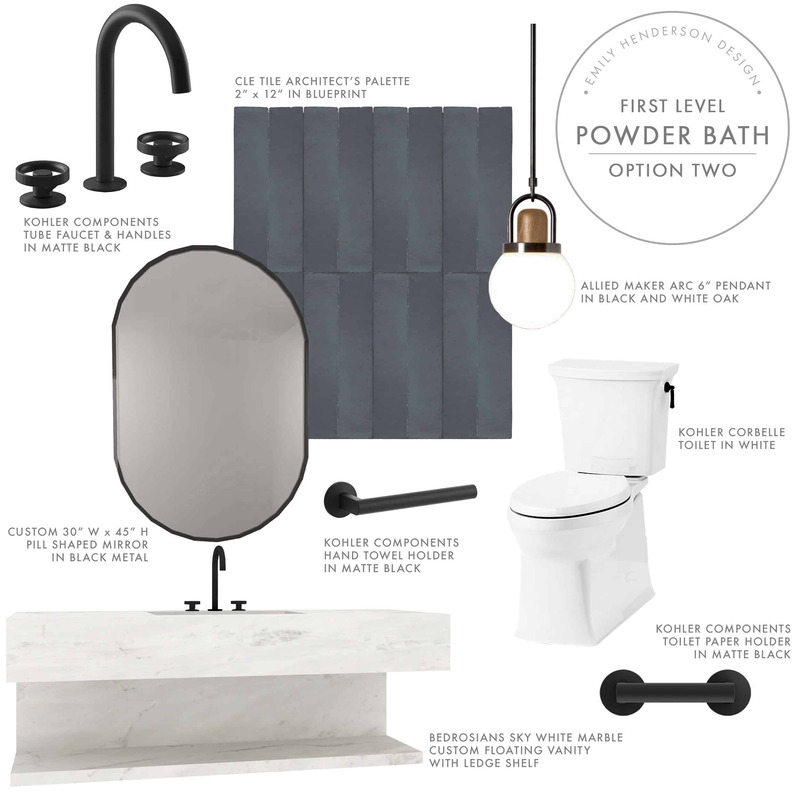 Both are great looking but how long does anyone spend in a powder room – go for the wow. I’m sorry – I know you want the blue to win, but I LOVE the black and white. It is fun and unique and a great place to take a risk. I trust that the house will look cohesive enough that you CAN pull this off in the powder room. I just love it. P.S. My phone keeps crashing when I try to vote so I can’t tell if it went through. I’m going to try it once more, but I swear I’m not trying to cheat! I just don’t want to miss registering to win :). I voted for option 2 because you wanted it more but I also want you to: 1) use the pendants from Option 1 and 2) VERY IMPORTANT!! –make the shelf of the vanity a free-standing shelf and NOT attached to the sink counter by the wall mounted slab. That looks not good to my eye and would be SO MUCH BETTER if you had the time continue down the wall begone the sink to break up the top edbe of the vanity and the shelf. Know that I am supposed to say “Just a suggestion!” but have to admit feel very passionate about this!! Going against the grain: I prefer everything about Option 1 but would rather not see the vanity all the way to the floor, and would want the tile below the vanity as well as above. The mirror/lamp combination in this option is awesome. Is there something wrong with the site? I can’t vote, but it says you can until the 25th. It’s the 18th. It loads the results without ever having the option to vote. Hi. Is something wrong with the site? It doesnt let me vote, it already has the results on the page. It says the voting goes to the 25th and its only the 18th. This is the first time I’ve been on the page. Also I tried to post this as a comment and it didn’t post the first time. Love the serenity of option two. I LOVE option one, especially the graphic tile. Such a fun powder bath! I love both versions so much. It’s true you can go bold with a half bath. Why are you making this so difficult, haha? As much as I love the tile in Option 1, I ended up voting for 2. That mirror in Option 2 is gorgeous. Sorry, I am not a fan of either tile. The gray is too dark and the geo is too busy. Definitely option 2 pendants. Option 1 will date quickly with the leather straps. Like leather cupboard handles, everyone will always remember ‘the scandi’ period in the late 2010’s. Love the option 1 tile though. If this tile is too busy with everything else in the house, then perhaps everything else in the house is a little ‘vanilla’!! Can you put the blue tile on the design of the first one? I voted for the second because a) you should be happy with your house and b) I like the blue tile way better than the busy one which does NOT look mountain, but I like everything else about design one better. 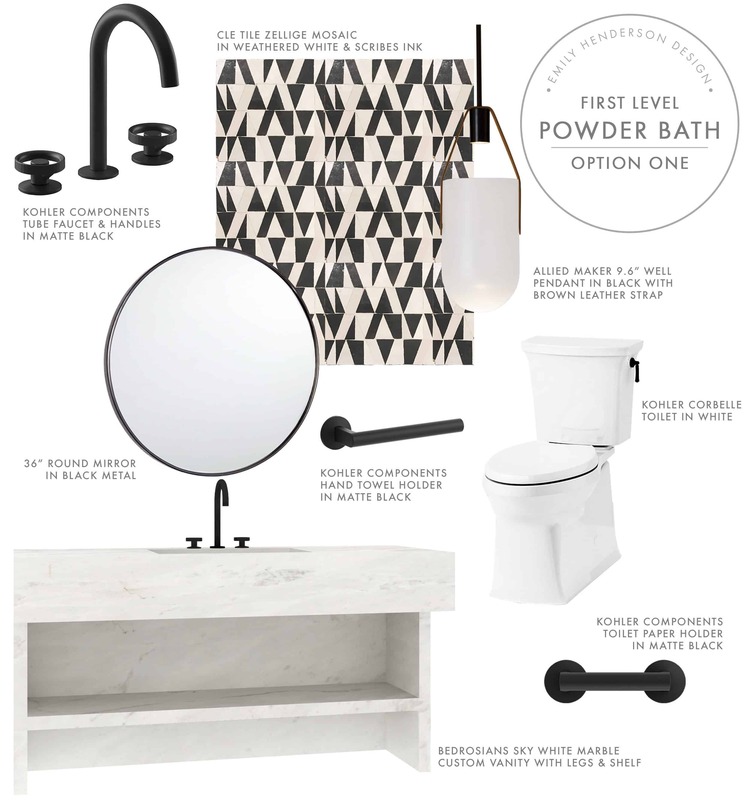 I love the first one and think that while it may feel different from the rest of the house, isn’t that kind of the best part about having a powder room? I have an eclectic transitional house with mostly whites, blues, and grays with hints of black so in my powder room I went all out and painted it black. Everyone, and I mean everyone, loves it and thinks that it’s fun and funky. It’s the perfect place to be a little riskier. Plus, if you want to tie it into the house a bit better, why not bring in soap dispensers and other needed accessories that coordinate with the rest of the house better? It’ll be like mixing patterns in fashion but having that unifying accessory that brings it all together. I love EVERYTHING about Option 1! The patterned tile, the large round mirror, the warm leather on the pendants… Go for it! I do not like the pill shaped mirror! And I like the vanity better in the first one too, I guess the only thing I like in the second one is the tile and lights. I guess I’m in the minority but I Love the tile in option 1! It looks like little mountains and you are in a mountain cabin, right? Option 2 looks very sterile to me. And I like the vanity sitting on the floor. MHO! I am sure that first tile is amazing in person, but that blue tile is stunning, and fits so well with the rest of the house! I definitely like the blue tile better than the black and white, but there’s something I’m still not quite crazy about… I think it’s the accent wall of tile. Would it be possible to do all four walls? Or would that be insanely expensive? The tile in the first is super cool…. but isn’t the house you are designing. The second makes me excited, especially that beautiful floating vanity. Can’t wait to see! love that vanity – how do you access the plumbing (shut off valves, etc)? Blue tile with vanity and pendants from option one! I’d like a combo of the 2: dark tile, yes, but the mirror & lights from the other design. I think that capsule shape just reiterates the long vertical tiles too much. P.S. Do you know what the ingredients are in the cleaning tablets that are used in the toilet? what if they contain bleach? or some other equally nasty-for-the- environment stuff? I voted for 1 but I want the tile of 2! Definitely option 1! I only think the frame of the mirror should be a bit thicker to make it easier on the eyes, that would also make the hardware more visible and pop more from the background. I actually like the first bathroom. But, if you are set on the 2nd tile – think the vanity, mirror and lighting from the first photo would look good with the darker tile. I’m going to go against the popular chat I see below and vote for the version #1 but with the pendants from #2! I like the heavier black outline on the lights rather than the pill shape. The way the vanity floats in #2 seems awkward to me…it feels neither here nor there because it has 2 pieces–it doesn’t really float…I like the legs in #1. Also, I like the joy and whimsy in the black and white tile over the heavy blue. I like a happy powder room. Blue tile, mirror from nr 2, pendants from nr 1… ( even tho I would use the FLOS pendants, that are just amazing + marble hexagonal mosaic on the floor and an integrated toilet with concealed cisterns. They just look so much better than the exposed ones. Option 2 but with a eound mirror 100%!! I agree with the masses… Keep the mirror, pendants and vanity from #1, but love everything else in #2.
curious to know what what program you used to create such realistic rendering? both bathrooms look stunning. Option2 is good! I love, love, love option 1 everything! Where’s the fun in solid colored tile when there’s products like the other? It’s just a powder room. Have fun with it I say! Combined. Fixtures from 1; tile from 2. Option 3 per IG stories. If introducing fun pattern like 1, how about ceiling with versatile wallpaper? I voted Option 2 just for the tile, but I like the pendants and mirror from Option 1. As far as the vanity goes, either option looks great! i vote for the blue tile with everything else in option one. i love the pendants, vanity and round mirror in the first option. now just add the blue tile and it will be perfect! Love the triangle pattern, but completely agree that it doesn’t work with the rest of the house as well. That being said, I am kinda disappointed you don’t have a mountain-esque wallpaper in this little powder room. I always love a bold wallcovering in small bathrooms to make a statement! Have you thought about putting a white tile 3/4 up the wall and then the top 1/4 being a bold, dark wallcovering? Would love to see something other than tile?! I prefer the tile from option 1 but could go either way but I love the globe pendants in #2 (but not the mirror) I would make the design work with them. A rectangular mirror then maybe? option 2 with option 1 mirror and lights please! That was a tough vote. I loved Option #1 from the sink down and Option #2 from the sink up. LOVE option #2. I think if you switch it out for the other pendants and mirror from option #1 it’ll go too basic and the shapes too redundant (with the pill shaped mirror from #2 and pill shaped fixtures from #1). Love the pill shaped mirror juxtaposed with the rounded shape of the light fixtures in Option #2. If I had my way, I’d blend the two. I like the tile and lights from option #1 and the mirror shape and simplified vanity from option #2. I’d take everything in the first option but switch the tile to the blue one! I agree with a lot of comments. Option #1 mirror & scones with option #2 tile. And the vanity not going all the way to the floor. Is there a different matte black faucet tho? The handles on this one would be annoying to use & clean. I like them both….maybe Option 1 a little more. It’s fun. You are so talented. Cheers! So excited to see that blue tile when the execution is finally done! Although I love option 2 the best (especially those light fixtures), I think what could make that space interesting and personal, is having a mirror that is more sculptural/asymmetrical/ organic. It would break up all the straight line and edges from the bathroom tiles and vanity and make the space truly unique without getting too busy. I know CB2 has one, or find a local shop that can make it? Some kind of live edge wood framing. I’ve played it safe on most of the options that have been posted but this one I would love to see tile in #1. But, then again, I love all the printed tiles too that are on the market. I love the lights in option 2 (what a price tag!) – that wood and that sweet round globe! All I can think about with lights in 1 is cleaning the bugs from the bottom (Ha!). Can not wait to see this all in the end!!!!! Thank you for sharing all the thought processes! Agree with the pendants from option 1 with the tile and vanity from option 2, but use the mirror from option 1 too. option #1 hands down. I dont trust shapes that are in between round and square, cough cough, mirror on the second option. It hogs too much attention and throws things off in my opinion. Plus that light on the second option looks too nautical for a cabin i think. The tile in the first option reminds me of rain or snowfall, love it. Then again, my opinion counts probably as much as the Fedex guy, cause I am not a designer. What about putting the blue tile horizontally? I’m on team #2 tile, #1 mirror/sconces/vanity. Although I love the #1 tile too! I can’t vote. I love them both. Funky vs. clean & serene. I’m personally into the oval mirror, but I agree with some who have said that the vanity should be carried to the floor. It’s too dark under there and makes the room appear a bit dreary rather than cheerful. Somehow it makes a big difference in the mood. Consider putting hooks for hand towels at the base of the vanity one each side. This will reduce the visual clutter up above and keep the clean look going. Also, no one should have to turn in order to reach the toilet paper. Check the NKBA standard for placement as the holders in the renderings look set too far back. Option 3! Option 1 with the blue tile absolutely! Please?? Pretty please? Love the brightness of the patterned tile! Hi Emily, I saw on the giveaway post that we are supposed to share a poll to enter. Am I missing the poll on this page? Sorry for my confusion!